The human face is composed of small functional and cosmetic units, of which the eyes and periocular region constitute the main point of focus in routine face-to-face interactions. This dynamic region plays a pivotal role in the expression of mood, emotion, and character, thus making it the most relevant component of the facial esthetic and functional unit. Any change in the periocular unit leads to facial imbalance and functional disharmony, leading both the young and the elderly to seek consultation, thus making blepharoplasty the surgical procedure of choice for both cosmetic and functional amelioration. The applied anatomy, indications of upper eyelid blepharoplasty, preoperative workup, surgical procedure, postoperative care, and complications would be discussed in detail in this review article. Blepharoplasty is a surgical procedure in which the eyelid skin, orbicularis oculi muscle, and orbital fat are excised, redraped, or sculpted to rejuvenate the esthetic look of the patient along with correction of any functional abnormality., The word “blepharon” means eyelids and “plastikos” means to mold. In general, the upper eyelid blepharoplasty (UEB) is done for both esthetic and functional indications while the lower eyelid blepharoplasty is commonly performed for esthetic rationales. Arabian surgeons, Avicenna and Ibn Rashid, described the significance of excess skin folds in impairing eyesight way back in the 10th and 11th century. They excised this skin to improve vision, thus giving the first example of a surgical approach toward the management of dermatochalasis. In 1818, Karl Ferdinand Von Graefe (father of Albrecht von Graefe, Ophthalmologist) first coined the term “blepharoplasty” while reporting an eyelid reconstruction. Since then, blepharoplasty has evolved and becomes the most commonly performed facial esthetic surgery. Besides being performed for esthetic concern, UEB is considered to be the procedure of choice for correcting dermatochalasis for functional indication. Understanding anatomy of the eyelid complex is of foremost importance in precisely assessing the patient before surgery. Eyelid skin is the thinnest in the body and has no subcutaneous fat layer. It measures <1 mm. Owing to the thinness of the skin of the eyelid and the constant movement with each blink, a certain amount of the laxity occurs with age. The pretarsal tissues are firmly attached to the underlying tissues. On the contrary, the preseptal tissues are loosely attached which lead to potential spaces for fluid accumulation. The upper eyelid can be divided into tarsal and orbital portions at the level of the supratarsal fold  (formed by the fusion of the levator aponeurosis, orbital septum, and orbicularis oculi fascia). The Caucasian eyelid holds this fusion approximately 3–5 mm above the upper border of the tarsal plate while, in the Asian eyelid, it lies a little lower, i.e. between the eyelid margin and superior border of the tarsus causing very often a single eyelid configuration. The orbital septum whose function is to retain the orbital fat lies deep to the orbicularis fascia. It is continuous with the periosteum of the orbit and fuses with the levator aponeurosis 10–12 mm above the superior tarsal border. Posterior to the orbital septum and anterior to the levator aponeurosis are the preaponeurotic fat. This layer of orbital fat can be divided into the yellow-colored central fat pad and the white nasal fat pad [Figure 1]. It is of utmost importance to distinguish during surgery the central soft yellow orbital fat from the temporally adjacent prolapsed lacrimal gland, which is easily distinguishable by its firm nature, pinkish-gray color, and glandular structure. Posterior to the preaponeurotic fat pads are the levator aponeurosis and levator muscle. Ten to 12 mm above the superior tarsal border, the sympathetic muscle of Muller leaves the posterior surface of the levator aponeurosis and inserts at the superior border of the tarsus. An understanding of the eyebrow position is important for good esthetic and functional outcomes. Before determining the amount of upper eyelid fold resection, the brow level and contour should be established. Brow ptosis is the drooping of the brows which is caused by the loss of elastic tissue and involutional changes of the forehead skin and frequently accompanies dermatochalasis. The muscles of the eyebrows are among the most important muscles of facial expression and are strong indicators of mood and feeling. The correction of brow ptosis can lead to remarkable cosmetic outcomes. The eyebrow is composed of pilosebaceous units, muscle, and fat. The orbital orbicularis oculi, frontalis, procerus, and corrugator supraciliaris muscles are present in the region of the eyebrow. The frontalis muscle inserts in the skin of the eyebrow and has no bony attachments. It is responsible for the elevation of the eyebrows and acts as a synergist to the levator palpebrae superioris. The corrugator supraciliaris inserts superficially into the medial half of the eyebrow and depresses and pulls it toward the midline. The procerus muscle contracts with the orbicularis and corrugator to depress the brow. Contraction of the procerus muscle results in the horizontal creases of the root of the nose, and that of the corrugator creates vertical glabellar lines. The eyebrow rests on a fat pad, which improves its motility. This fat is usually located above the superior orbital rim. Hereditary factors and involutional changes can cause a descent of eyebrow fat. As a result, it encroaches on the upper eyelid space and gives it a full appearance. This descended fat may occasionally be mistaken for the preaponeurotic space and fat beneath the orbital septum. Brow ptosis can be medial, central, or lateral. If the eyebrow is markedly ptotic, a browplasty must be considered before an UEB. If the temporal aspect of the eyebrow droops the most, a small temporal direct browplasty can be used to lift the eyelid, or in minimal lateral brow ptosis, an internal browpexy can be combined with an UEB. Dermatochalasis or sagging eyelids are a common condition with skin redundancy and lid atrophy of the upper eyelids mostly caused by aging [Figure 2] and [Figure 3]. The overall prevalence of sagging eyelids among individuals aged more than 45 years is reported to be 16% and it is more frequent in males. It has been reported that there has been an increase in life expectancy all over the globe; thus, chronic and involutional eye problems are becoming increasingly crucial in the gamut of eye diseases. Among the other involutional changes such as ectropion, entropion, and aponeurotic ptosis, the incidence of dermatochalasis is also rising. Dermatochalasis usually results from the normal physiological senile changes occurring in the periocular soft tissues. The traction caused due to the contraction of the orbicularis muscle, over a period of time, along with gravity, leads to a loss in the quantity of elastic tissue in the skin, and weakening of the connective tissues leads to relaxation of the structures of the lateral part of the forehead. All these factors result in lowering of the lateral third of the eyebrow and an appearance of excess skin in the lateral corner of the upper eyelid. It is typically a bilateral condition and mostly seen in the elderly leading to both functional and cosmetic problems. The usual presentation is with cosmetic concerns and patients complaining of “droopy eyelids” which leads to either dull appearance or looking older than their age. Ocular irritation secondary to chronic blepharitis, dry eye, and misdirected lashes are other complaints which can coexist. Very often, it is associated with lateral lash ptosis with lateral hooding. Apart from the usual complaints, a significant number of patients report obstruction of the peripheral temporal visual field or reduction in the quality of vision, eventually leading to an impairment of daily activities. Restriction in the visual fields due to dermatochalasis has been extensively studied and well documented.,,, There can be many reasons for this restriction. The most common being the mechanical obstruction of the visual fields due to overabundance in the redundant eyelid tissue. Second, the redundant eyelid tissue may cause the eyelashes to deviate and get in the patient's line of vision. Hacker and Hollsten evaluated the visual fields of 17 patients undergoing UEB and documented an improvement of 26.2% in the superior visual field. There have been reports of significant improvement in contrast sensitivity of the patients undergoing blepharoplasty surgery for dermatochalasis as well. The proposed explanation for this is that the redundant and overhanging skin blocks the light entering the eye and causes diffraction. After surgery, the diffraction of the light is reduced or eliminated. Meyer et al. documented contrast sensitivity in patients with dermatochalasis undergoing upper lid blepharoplasty. Twenty-eight eyelids of 14 patients showed statistically significant increases in contrast sensitivity, resulting in brighter vision. In addition, a reduction in the ocular aberrations, specifically the high-order aberrations (HOAs), results in improved point spread function and provides more vivid retinal image. HOAs are an index of visual quality. When ocular aberrations increase, visual symptoms including distortion, halo, and glare can occur. Correction of HOAs improves contrast sensitivity and hence visual acuity. Kim et al. measured the contrast sensitivity and HOA in 22 eyelids of 16 patients with dermatochalasis. They attributed the improvements in contrast sensitivity after UEB to the changes in the HOAs. Dermatochalasis is an involutional process characterized by excessive redundant skin folds sometimes aggravated with fat prolapse through the orbital septum. These large fat pads may alter pressure on the cornea and change its shape, resulting in astigmatism. Fat reduction following upper lid blepharoplasty may induce significant corneal shape changes, which have been correlated with topographical corneal changes. Brown et al. evaluated changes in the corneal topography after upper eyelid surgery. Eighteen eyelids undergoing blepharoplasty showed an average astigmatic change of 0.55 dioptres. They concluded that the eyelid repositioning after upper eyelid surgery results in visually significant astigmatic changes in the cornea. Hence, improved visual field, increased contrast sensitivity, HOA reduction, and improvement in corneal topographic measurements following upper lid blepharoplasty may lead to improved functional visual acuity. 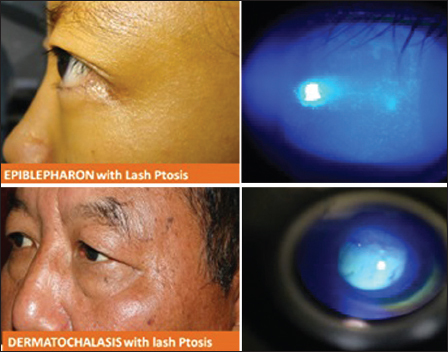 It has been reported that both dermatochalasis and upper eyelid epiblepharon are usually associated with lash ptosis [Figure 4]. The ocular surface is subjected to constant microtrauma by the ptotic lashes causing damage to the surface epithelium and thereby triggering a cascade of inflammatory events. Release of inflammatory mediators into the tears causes tear film instability and exacerbation of ocular surface hyperosmolarity, thereby completing the vicious cycle of events and leading to dry eyes. It is an affliction of young people that produces redundant tissue of the upper eyelid. It is characterized by relaxation and atrophy of the tissues of the upper lids following attacks of edema. The condition starts with intermittent painless angioneurotic edema and redness, usually at puberty. It is aggravated by crying and menstruation. Repeated attacks result in bagginess of the upper lids. Blepharoplasty is also indicated in diseases such as Graves' ophthalmopathy and blepharochalasis which are sequelae of inflammatory disorders of the orbits and eyelids. Trauma to the eyelids and orbit may also result in the need for a functional blepharoplasty. Blepharoplasty of the upper eyelid is performed for excising a large xanthelasma, removing a mass, correcting a traumatic or developmental eyelid anomaly, or excision of a tumor. The younger patients go in for UEB mostly for cosmetic concerns while the elderly and middle aged have both cosmetic as well as functional issues [Figure 5]. Young individuals, especially the Asian and Northeast Indians with the typical Asian eyelid features, demand for creating or modifying eyelid crease or for achieving higher or symmetrical creases. Here, blepharoplasty plays a vital role in facial rejuvenation, with direct esthetic relation to the brow and the cheek. 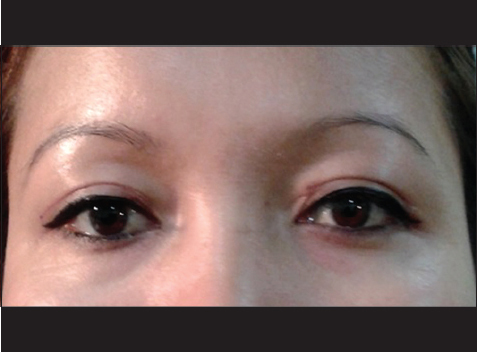 Moreover, upper and lower eyelid blepharoplasties are also indicated for the removal of excess skin and/or orbital fat. In evaluating patients for blepharoplasty, the surgeon must determine several factors. A complete medical and ocular history should be obtained, along with a thorough ophthalmologic examination. A proper history of any trauma or previous surgery should be recorded. Patients should be evaluated for thyroid disease and dry eye disease. Seventh nerve function should also be evaluated. History of bleeding disorder and use of aspirin should be specifically noted and adequately avoided. Preoperative photographs should be taken with the eyes in primary position. Meticulous clinical examination for best-corrected visual acuity, palpebral fissure height and contour, upper eyelid position, eyelid crease and eyelid fold distance, eyebrow position, frontalis action, and tear film health should be meticulously examined. If UEB is indicated for functional attributes, then additional tests such as contrast sensitivity, visual field, HOAs, and corneal topography must be assessed pre- and post-operatively. Elaborate written and informed consent of the patient should be obtained before the surgery day to avoid any kind of preoperative dilemmas and anxiety. The most important aspects of blepharoplasty marking are the upper limit of skin excision and the skin crease. Marking can be performed with any dye that will not be removed completely when the patient is prepared. The methods of marking include the “skin pinch” or “skin flap” technique. The skin pinch method is done with the patient in the sitting position and the eyes closed. Depending on the natural palpebral fold, the lower incision line is marked. A small forceps is used to gather the excess skin between the jaws of the forceps. Upper eyelid crease markings are made when the eyelid skin appears smooth with no separation between the lids. In the skin flap technique, skin flaps are developed by separating the skin over the entire upper lid area from the underlying orbicularis muscle. The elevated eyelid skin is then carefully redraped over the orbicularis to produce an overlap of skins. The excess skin is marked and resected. 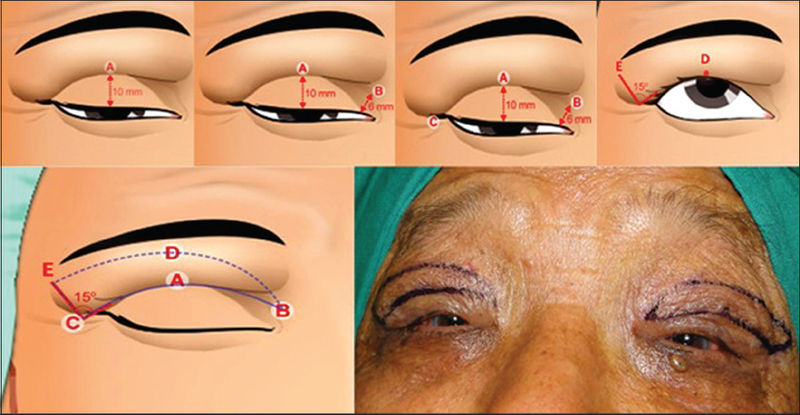 Bellinvia's incision  (beyond temporal brow margin) for counteracting lateral hooding. Although most surgeons prefer the skin pinch method for esthetic blepharoplasty, the authors prefer their own marking technique for extended blepharoplasty in dermatochalasis. Preoperative marking [Figure 6] is done under adequate lighting conditions while the patient is seated in a comfortable position looking in the primary gaze. Point A is marked 10 mm above the central lid margin. Point B is marked at 6 mm above the medial canthus. Point C is marked at the lowest point of the lateral hooding. The patient is asked to look up and the point where the eyelid margin is in apposition to the thick upper eyelid skin, approximately 2.5 mm above this, a point D is marked. This point signifies the vertical height of the skin marking. Point E is marked 8 mm above and at an angle of 15° from point C. All the points are joined in an ellipsoid fashion to complete the lid marking. The main difference in the skin-marking technique of both functional and esthetic indications is that in functional blepharoplasty, the lateral incision extends beyond the lateral canthal area as the lateral hooding and lash ptosis must also be managed, whereas in esthetic blepharoplasty, the lateral incision should not extend beyond the lateral canthal area [Figure 7]. UEB is usually performed under local anesthesia. Using a 27- or 30-gauge disposable needle, 2–3 ml of 2% lidocaine with 1:100,000 epinephrine is injected subcutaneously over the outlined upper eyelid and lateral canthus for anesthesia and hemostasis. After fashioning the skin incisions, one edge of the wound is lifted and the skin is excised using a radiofrequency cautery with a fine-angled empire tip. A strip of preseptal orbicularis is excised, and small incisions over the septum provide direct access to preaponeurotic fat pads. The medial (whitish) and central (yellow) fat pads can be differentiated by the color (embryonic origin, medial fat pad is neural crest derived) and are teased out gently through the small openings of the orbital septum. The fat pads should preferably be excised with electrocautery or be secured with a hemostatic clamp before excising using a radiofrequency cautery. The remaining stump in the hemostatic clamp is cauterized before aiding its retraction back into the orbit. The retro-orbicularis oculi fat is reposited back for restoring the eyebrow volume along with its internal fixation at desired position, i.e. 2–3 mm above the supraorbital rim, with two nonabsorbable sutures. Lid crease formation is done by interrupted, horizontal mattress sutures with 6-0 absorbable sutures passed through the orbicularis oculi muscle, superior border of the tarsal plate along with the levator fibers to create a prominent and desired eyelid crease. The skin is then approximated with continuous or interrupted, preferably nonabsorbable sutures (7-0 prolene). In the elderly age group, UEB is often accompanied by correction of brow ptosis either by internal browpexy, external browplasty, and corrugator myectomy. A browpexy is a suture suspension of the brow to the underlying frontal bone. It can be performed from within the eyelid (internal browpexy) or from a small incision above the brow (external browpexy). Various surgical approaches to brow lift surgery have been described. Direct brow lift involves excision of supraorbital skin and subcutaneous tissue above the eyebrow, with closure of the subcutaneous tissue and the skin. In temporal brow lift, the incision is made behind the temporal hairline, and the dissection plane is over the fascia temporalis proper toward the lateral orbital rim along with soft tissue fixation. In transpalpebral browpexy, through an upper eyelid crease, the lateral brow is fixed to the frontal periosteum, at a more cephalad position. Pretrichial brow lift involves incision just in front of the hairline to lift the brow. Mid-forehead lift involves the utilization of deep forehead creases for placement of the incision. Skin and subcutaneous tissue is excised along with direct closure without tension. Coronal brow lift is a type of an open-sky technique; skin and subcutaneous tissue is excised several centimeters behind the hairline. Endoscopic brow lift - Endoscopic brow lift has become widely accepted as a procedure for restoring a youthful brow, as only three hardly noticeable incisions of the scalp are needed for this subperiosteal dissection and final repositioning of the brow. Avoid applying eye makeup for minimum of 10–14 days. Postoperatively [Figure 8]: It can occur in the early postoperative period from fragile blood vessels. It can be prevented or minimized by appropriate injection techniques, optimum control of blood pressure, and by discontinuing blood thinners. After the advent of radiofrequency cautery, the incidence of intraoperative muscular or fat bleeding has reduced. Preseptal hematomas cause no effect on the final visual acuity but can lead to delayed recovery and unpleasant appearance. Cooling eyelid with the help of ice packs has a role in reducing pain, hematoma, edema, and erythema. However, some controversy exists in it use. A randomized control trial by Pool et al. concluded that there is no role of eyelid cooling in reducing pain, edema, erythema, and hematoma. Asymmetry - It is one of the most common complications. One of the main aims of UEB is to achieve symmetry between the two eyelids. Eyelid crease being an important surgical and cosmetic landmark, any asymmetry becomes readily apparent. According to Bosniak and Castiano-Zilkha, while correcting asymmetry, surgery is performed on the eyelid with the higher crease. It is easier to lower an eyelid crease than to elevate it because there is an adequate amount of residual upper lid skin. 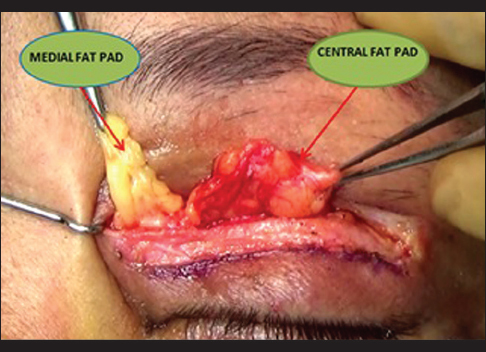 Residual upper lid fat or excessive fat resection may lead to superior sulcus asymmetries. While encountering a dog-ear appearance, fine asymmetric scars especially may occur. Therefore, an appropriate symmetry should be maintained from fashioning the skin incisions up to wound closure. While the lateral scar asymmetry is mainly preventable, the medial webbing of scar can be managed with V-Y plasty. Digital massage and vitamin creams may help in early postoperative period. Lagophthalmos - Lagophthalmos may occur due to upper eyelid retraction owing to postoperative fibrosis of the levator aponeurosis from excessive cautery or marked postoperative inflammation. Due to longer anesthetic affect or hematoma/trauma, lagophthalmos can occur in early postoperative period. In the late stages, any excessive excision of skin muscle may shorten the anterior lamella causing a cicatricial type of lagophthalmos. Ptosis - In general, this situation arises as a result of inappropriate preoperative eyelid examination in which an existing blepharoptosis was missed. The blepharoptosis becomes prominent once the dermatochalasis resolves after surgery. Direct injury to the LPS intraoperatively can also lead to ptosis. It may also occur without direct injury to the muscle as it is seen in intraocular surgeries such as cataract surgery. In such cases, a levator surgery is required which can be performed through the same incision site. 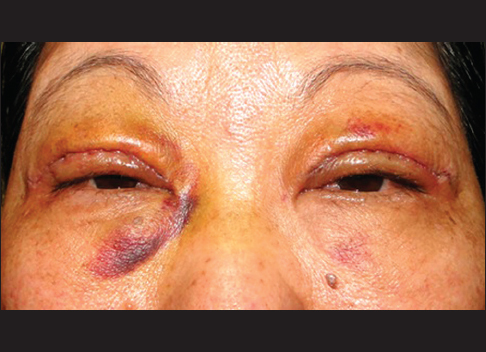 A transient mechanical ptosis may occur following lid edema postoperatively or due to levator paresis following aggressive fat resection or cautery. It resolves without any treatment within several weeks. Scar-related issues [Figure 9] - Owing to the rich vascularity of the eyelids, wound infections or scars are rare. Generous application of ointment to the wound during the first 5 postoperative days may also avoid suture cysts. Few important problems related to wound modulation and healing that can occur are medial webbing, pigmentation, scar hypertrophy, and persistent scar erythema. Local Vitamin E cream, directional digital massage, subcutaneous injections of antifibrotic agents, and steroid creams are helpful in such situations. Effective and safe scar management option can be silicone-based gels. Epithelial inclusion cysts may require excision or marsupialization. The use of larger sunglasses and sunscreens is advised for protecting the surgical area from direct sunlight exposure. Orbital hematoma/compartment syndrome  - This is considered to be a postoperative emergency in UEB patients. It happens mainly in the immediate postoperative period. Patient complaints include severe, sudden-onset, pain along with profound vision loss. The active hemorrhage is not recognized on table due to the retraction of the bleeding vessels back into the orbit, and the surgeon closes the wound routinely. Postoperative the hematoma grows in size and may cause ischemic damage to the optic nerve due to raised intraorbital pressure. The patient presents with a proptosed and congested globe with limitation of ocular movements along with a dilated pupil. The wound is opened up, the bleeders are located, and a hemostasis is achieved. If the pupil is dilated immediate lateral canthotomy, cantholysis is performed. Systemic steroids and osmotic agents are used. Lymphedema - As many of the lymphatics may get severed while giving incision over the eyelid, a chronic type of eyelid edema may occur postoperatively. This edema gradually resolves as these lymphatics get their function back. Ocular motility disorders - Although a rare complication of UEB, ocular motility disturbances owing to extraocular muscle injuries have been described. It can occur transiently due to the deeper diffusion or extravasation of the anesthetic agent. During resection of fat injury may occur to the trochlea and superior oblique muscle, which may lead to postoperative diplopia. The UEB, which is the most common esthetic surgery performed, is a challenging procedure both in terms of surgery and patient satisfaction. The importance of “ first listening and understanding the patient's expectations” is more significant in the context of blepharoplasty than with the other surgeries. Careful examination for the coexisting eyelid and ocular surface abnormalities should be conducted. The position, symmetry, and contour of the eyebrow play a considerable role in the final appearance of periocular region. Overall, the patient must be informed about the final goal of achieving a balance of the facial appearance with the age of an individual. The more time spent in the preoperative period counseling the patient, the less is the postoperative time spent in explaining the untold. McCord CD. Upper blepharoplasty and eyebrow surgery. In: Chen WP, editor. Oculoplastic Surgery. New York: Thieme; 2001. p. 125-45. Rees TD. Blepharoplasty. In: Rees TD, Wood Smith D, editors. Cosmetic Facial Surgery. Philadelphia, PA: Saunders; 1973. p. 44-133. Von Graefe CF. De Rhinoplastice. Berlin: Dietrich Reimer; 1818. p. 13. Kersten RC, Codere F, Dailey RA. Orbit, Eye-lids, and Lacrimal System. San Francisco: American Academy of Ophthalmology; 2003. Liu D. Oriental eyelids: Anatomic difference and surgical consideration. In: Hornblass A, editor. Oculo-plastic, Orbital, and Reconstructive Surgery. Baltimore: Williams and Wilkins; 1988. p. 513-24. Januszkiewicz JS, Nahai F. Transconjunctival upper blepharoplasty. Plast Reconstr Surg 1999;103:1015-8. Siegel RJ. Essential anatomy for contemporary upper lid blepharoplasty. Clin Plast Surg 1993;20:209-12. Bosniak S, Castiano-Zilkha M. Cosmetic Blepharoplasty and Facial Rejuvenation. 2nd ed. New York: Lippincott-Raven; 1999. Nerad JA. Oculoplastic Surgery: The Requisites in Ophthalmology. St. Louis: Mosby; 2001. Leather BB, editor. Blepharoplasty. In: Oculoplastic Surgery. London, UK: Informa Healthcare; 2011. p. 310-45.
Pepper JP, Moyer JS. Upper blepharoplasty: The aesthetic ideal. Clin Plast Surg 2013;40:133-8. Jacobs LC, Liu F, Bleyen I, Gunn DA, Hofman A, Klaver CC, et al. Intrinsic and extrinsic risk factors for sagging eyelids. JAMA Dermatol 2014;150:836-43. World Health Organization. World Health Statistics 2009. Geneva: World Health Organization; 2009. Available from: http://www.who.int/gho/publications/world_health_statistics/EN_WHS09_Full.pdf. [Cited on 2016 Jun 19]. Damasceno RW, Avgitidou G, Belfort R Jr., Dantas PE, Holbach LM, Heindl LM. Eyelid aging: Pathophysiology and clinical management. Arq Bras Oftalmol 2015;78:328-31. Bellinvia G, Klinger F, Maione L, Bellinvia P. Upper lid blepharoplasty, eyebrow ptosis, and lateral hooding. Aesthet Surg J 2013;33:24-30. Hacker HD, Hollsten DA. Investigation of automated perimetry in the evaluation of patients for upper lid blepharoplasty. Ophthal Plast Reconstr Surg 1992;8:250-5. Cahill KV, Bradley EA, Meyer DR, Custer PL, Holck DE, Marcet MM, et al. Functional indications for upper eyelid ptosis and blepharoplasty surgery: A report by the American Academy of Ophthalmology. Ophthalmology 2011;118:2510-7. Meyer DR, Stern JH, Jarvis JM, Lininger LL. Evaluating the visual field effects of blepharoptosis using automated static perimetry. Ophthalmology 1993;100:651-8. Kosmin AS, Wishart PK, Birch MK. Apparent glaucomatous visual field defects caused by dermatochalasis. Eye (Lond) 1997;11(Pt 5):682-6. Fowler BT, Pegram TA, Cutler-Peck C, Kosko M, Tran QT, Fleming JC, et al. Contrast sensitivity testing in functional ptosis and dermatochalasis surgery. Ophthal Plast Reconstr Surg 2015;31:272-4. Song IS, Kim MJ, Yoon SY, Kim JY, Tchah H. Higher-order aberrations associated with better near visual acuity in eyes with aspheric monofocal IOLs. J Refract Surg 2014;30:442-6. Yoon GY, Williams DR. Visual performance after correcting the monochromatic and chromatic aberrations of the eye. J Opt Soc Am A Opt Image Sci Vis 2002;19:266-75. Kim JW, Lee H, Chang M, Park M, Lee TS, Baek S. What causes increased contrast sensitivity and improved functional visual acuity after upper eyelid blepharoplasty? J Craniofac Surg 2013;24:1582-5. Brown MS, Siegel IM, Lisman RD. Prospective analysis of changes in corneal topography after upper eyelid surgery. Ophthal Plast Reconstr Surg 1999;15:378-83. Johnson CC. Surgical management of benign lid lesions. In: Smith B, Converse JM, editors. Proceedings of the Second International Symposium on theories of upper eyelid blepharoplasty, Plastics and Reconstructive Surgery of the Eye and Adnexa. St. Louis: Mosby; 1967. p. 78-90. Adenis JP, Robert PY, Lasudry JG, Dalloul Z. Treatment of proptosis with fat removal orbital decompression in Graves' ophthalmopathy. Eur J Ophthalmol 1998;8:246-52. Wojno TH. Preoperative evaluation. In: Bosniak S, editor. Principles and Practices of Ophthalmic Plastics and Reconstructive Surgery. Philadelphia: WB Saunders; 1996. p. 545-50. 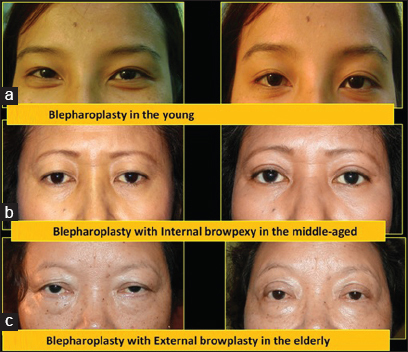 Hsu AK, Jen A. Estimation of skin removal in aging Asian blepharoplasty. Laryngoscope 2012;122:762-6. Lee JW, Baker SR. Esthetic enhancements in upper blepharoplasty. Clin Plast Surg 2013;40:139-46. Har-Shai Y, Hirshowitz B. Extended upper blepharoplasty for lateral hooding of the upper eyelid using a scalpel-shaped excision: A 13-year experience. Plast Reconstr Surg 2004;113:1028-35. Stambaugh KI. Upper lid blepharoplasty: Skin flap vs. pinch. Laryngoscope 1991;101:1233-7. Rees TD. The surgery of aesthetics: A modern dilemma. Aesthetic Plast Surg 1991;15:99-104. Nagi KS, Carlson JA, Wladis EJ. Histologic assessment of dermatochalasis: Elastolysis and lymphostasis are fundamental and interrelated findings. Ophthalmology 2011;118:1205-10. Whipple KM, Lim LH, Korn BS, Kikkawa DO. Blepharoplasty complications: Prevention and management. Clin Plast Surg 2013;40:213-24. Morax S, Touitou V. Complications of blepharoplasty. Orbit 2006;25:303-18. Pool SM, van Exsel DC, Melenhorst WB, Cromheecke M, van der Lei B. The effect of eyelid cooling on pain, edema, erythema, and hematoma after upper blepharoplasty: A randomized, controlled, observer-blinded evaluation study. Plast Reconstr Surg 2015;135:277e-81e. Iliff CE, Iliff JW, Iliff NT. Oculoplastic Surgery. Philadelphia: WB Saunders; 1979. Hamawy AH, Farkas JP, Fagien S, Rohrich RJ. Preventing and managing dry eyes after periorbital surgery: A retrospective review. Plast Reconstr Surg 2009;123:353-9. Honrado CP, Pastorek NJ. 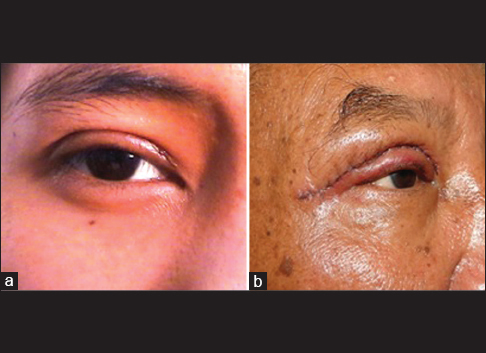 Long-term results of lower-lid suspension blepharoplasty: A 30-year experience. Arch Facial Plast Surg 2004;6:150-4. Friedland JA, Jacobsen WM, TerKonda S. Safety and efficacy of combined upper blepharoplasties and open coronal browlift: A consecutive series of 600 patients. Aesthetic Plast Surg 1996;20:453-62. Klapper SR, Patrinely JR. Management of cosmetic eyelid surgery complications. Semin Plast Surg 2007;21:80-93. Wilhelmi BJ, Mowlavi A, Neumeister MW. Upper blepharoplasty with bony anatomical landmarks to avoid injury to trochlea and superior oblique muscle tendon with fat resection. Plast Reconstr Surg 2001;108:2137-40.